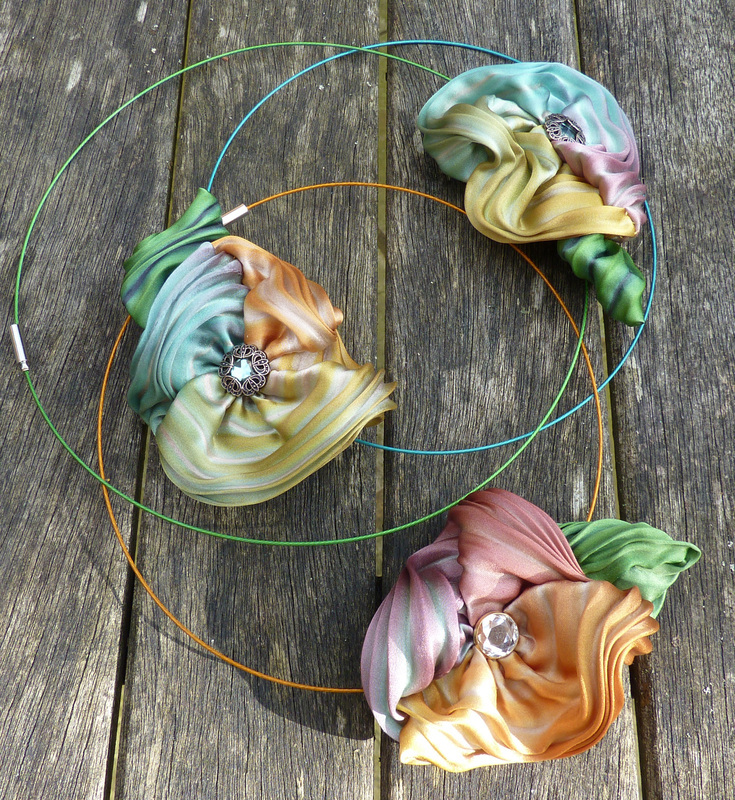 This sphere of flowers is made in four shades of blue and turquoise satin, each with a diamante centre. It would look equally good in pinks, black and white, shades of cream....printed cottons, the possibilities are endless. 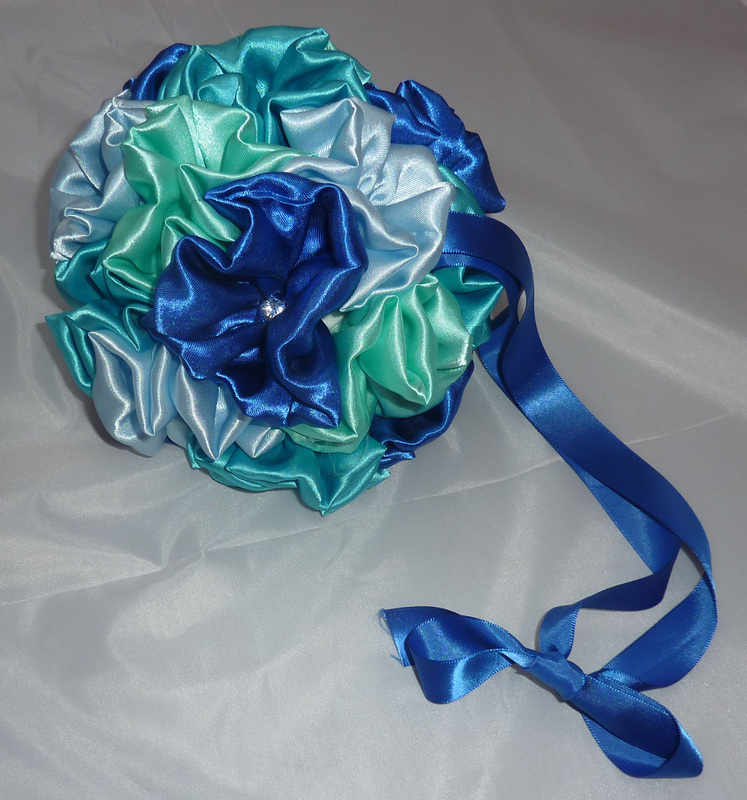 Smaller spheres can be made for bridesmaids and of course wrist corsages or ponytail decorations can be teamed as well. Call to discuss all the possibilities! The base of this bouquet is made using the principal of the coiled fabric baskets. 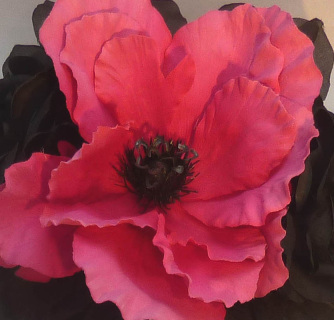 Made as loops of black satin, it is decorated with black flowers and leves and this lovely bright pink poppy and pink ribbons. 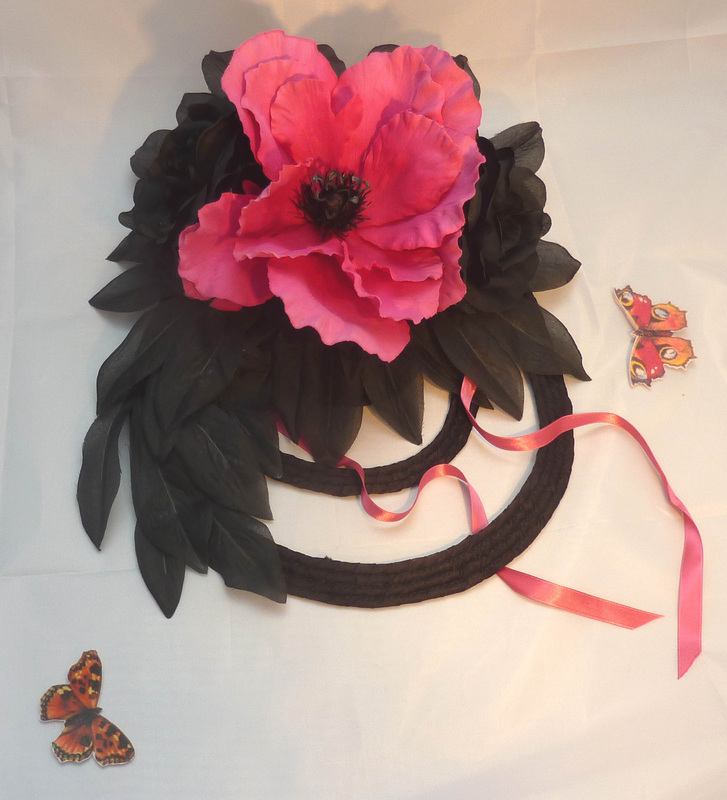 It would look just as interesting in pastel colours, bright autumn golds or in myriad prints, for that matter with a stunning orange or green flower trim! Let your imagination take you there! 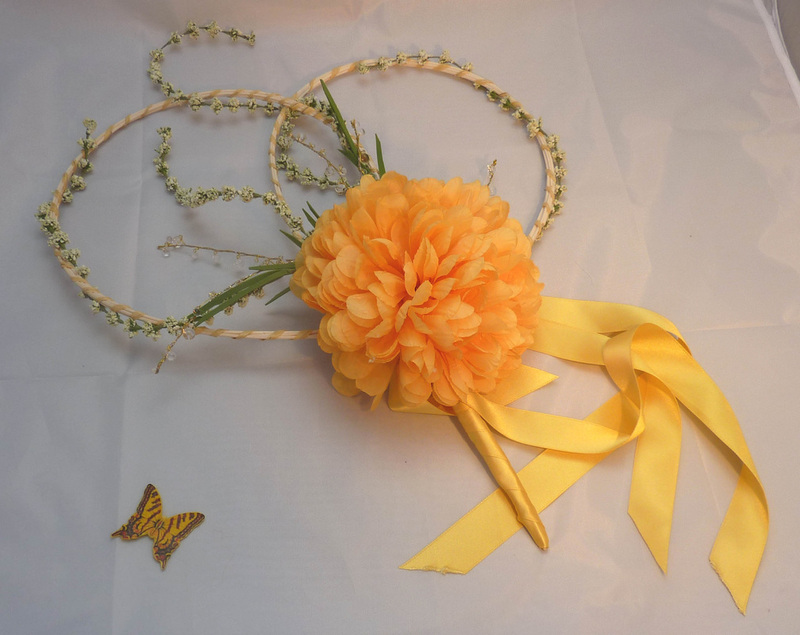 I have made the handle of this bouquet in such a way that it can be removed after your wedding day and you could then hang this on the wall, perhaps in a box frame - wouldn't that be stunning? 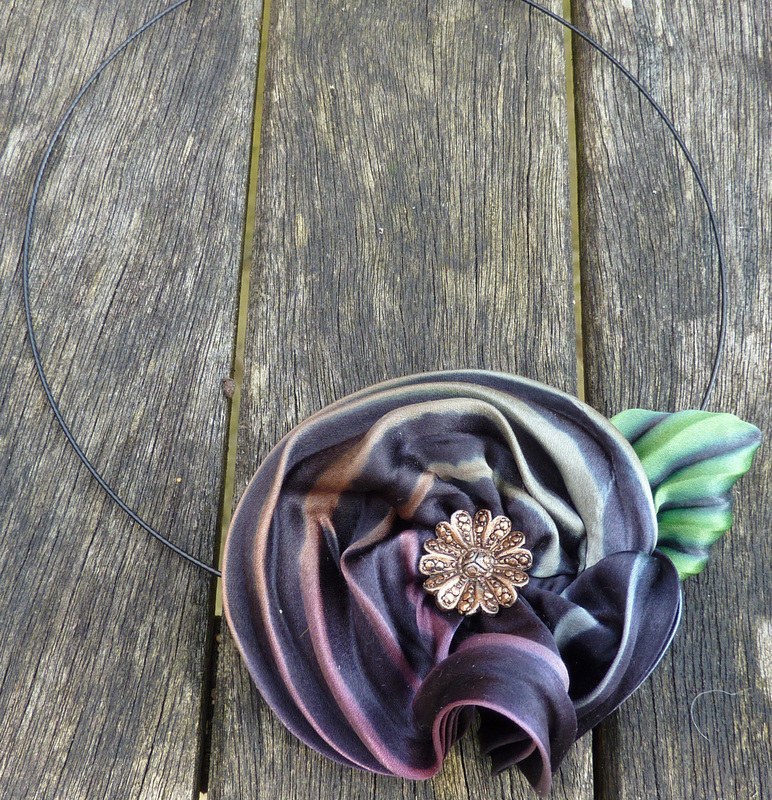 Pure silk ribbon hand dyed and pleated in the USA is used to make these beautiful flowers. 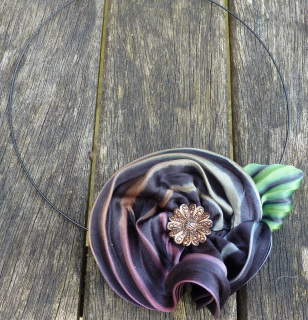 Every one is different due to the dying process and the way the silk curls when made up, and all the centres are vintage buttons, so will vary. Available as either chokers (on a wire necklet), corsages/ buttonholes or hair clips, they add an unusual twist to your wedding decorations. They could even be clipped to the back of your wedding dress to give everyone something to focus on when you are at the altar! Currently available in aurora (below) or midnight (above), other colours are available to order, but please allow and extra 12weeks for delivery. 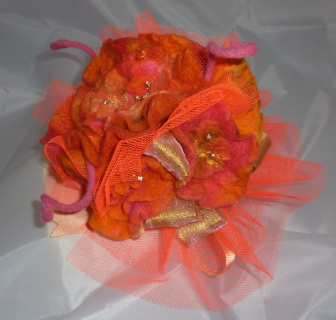 You can talk to me about any of the bouquets, pomanders, posies, corsages in any colour and size you like! 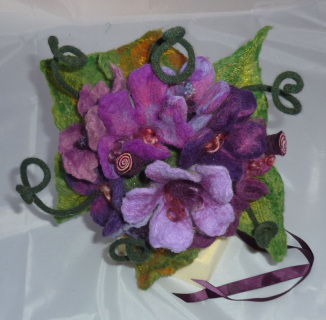 I can incorporate any of your own yarns, fabrics, beads and buttons too - create something really special you will treasure forever! Don't be mislead - this pretty bouquet in pastel cottons looks stunning but completely different and equally eye-catching in bright colours, or all one colour (or two), and can be made larger or smaller. It can be made in wool or cotton yarns and each gives a very different finished result. 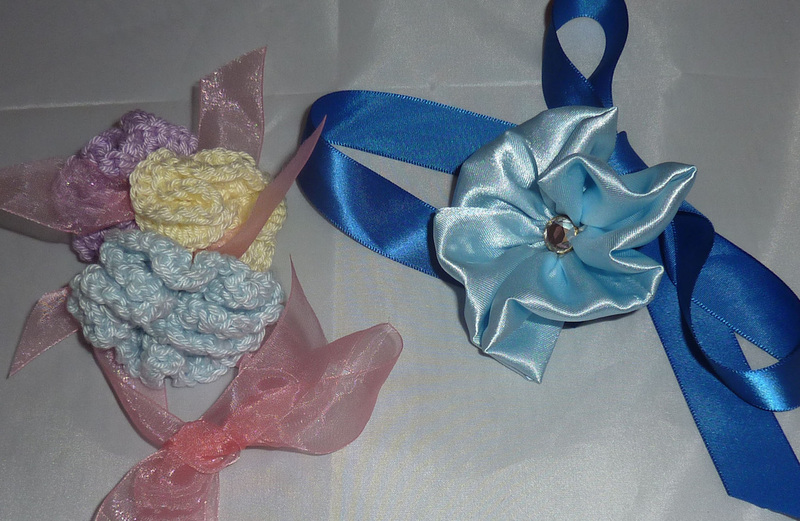 I can also make bridesmaids' pomanders to team and little wrist corsages or hair decorations for youngsters. 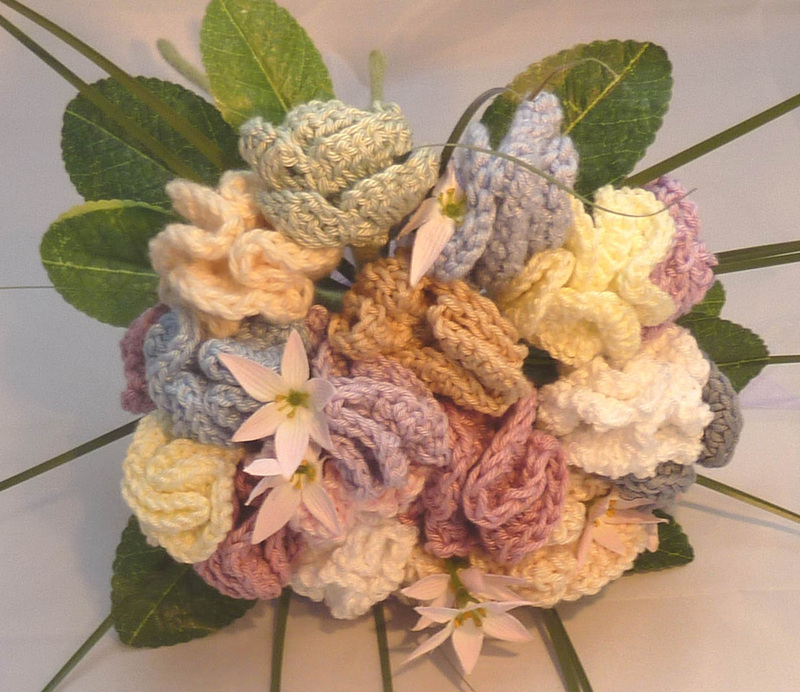 Another bouquet you can keep forever - or I can take it apart after your wedding and make each flower into a brooch for you to give to special friends as a reminder of your lovely day. If your bridesmaids are very young, it's easier to make their decorations immovable! Tie pretty flowers in their hair or on their wrist, or just above the elbow, and their hands are free to pinch and tickle each other, eat sweets or more importantly to run and play during the reception. A framework of cane holds this magnificent big blousy god chrysanthemum. The handles are trimmed with yellow ribbon. But like all my bouquets if you like the shape but not the colour, just get in touch and we can discuss alternatives! On the morning I designed this bouquet I was up early and the sky was the most wonderful shades of tangerines and pinks. It is handmade felt with imitation 'diamonds' on the stamens but would look just as pretty in other colours and you could have pearl stamens if you preferred - it can be personalised and made larger or smaller depending on what you have in mind. I thought maybe white flowers with black netting - now wouldn't that be eye-catching? Let me know what your preferred colours are!